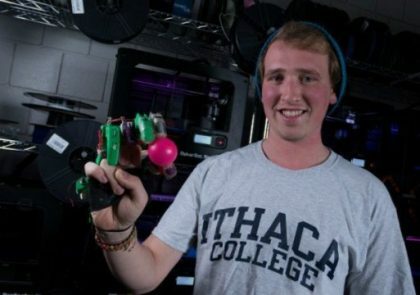 With a 3D printer and about $15, senior physics major Ryan Bouricius was able to create a functional prosthetic hand that can be used to grip, write and even catch a ball. With the assistance of a non-profit group, the hand will one day be matched to a person in need of such a prosthesis. The prosthetic hand is designed for a person who still has the ability to move their wrist. By moving their wrist, they can control and use the hand’s fingers to grab and hold various objects. Bouricius, who as a teaching assistant helps run the Ithaca College 3D Printing Lab, became interested in building prostheses after coming across a YouTube video of someone printing and assembling prosthetic hands for little cost. He instantly became interested. After doing some research, he found free designs online, printed out the pieces and assembled a hand in one day. Ever since, he has been working on the prosthesis and figuring out ways it can be improved. Through his testing and tinkering, Bouricius has made changes to the original design that give the hand more functionality. For example, he changed the orientation of the hand’s thumb, which was originally perpendicular to the fingers, so that it can more effectively grab a variety of items. He has also worked to optimize the grip for various items, such as a marker or a coffee mug. Physics Professor Michael ‘Bodhi’ Rogers oversees the 3D Printing Lab and has watched as Bouricius worked to improve the prosthesis. He says that the 3D-printed hand has many advantages over an electronic prosthesis. “There are people who are working on electronic hands, but they’re extremely expensive, not easy to repair, and many are not available for sale,” Rogers said. Bouricius says that unlike electronic hands, which are typically made from metal, complex components are not more expensive to make for his mostly plastic model. This is especially important for families with children who need prostheses. Because children outgrow them quickly, the costs of prostheses can be considerable over time. With 3D printing, however, Bouricius’ model can be affordably re-printed in larger sizes as the child grows. Bouricius is working with eNABLE, a non-profit organization that matches 3D-printed prostheses with those in need of them, to find a recipient for his printed hand.